Haese Mathematics, the market leaders in IB Diploma Mathematics, are publishing two Core books to enable students to study the first part of the course before having to commit to either the Applications or Analysis strand of study. We at Heath’s IB Bookshop will be importing the stock direct from the printers in China so printed samples and orders can be supplied by April. If you require a code to see the detailed samples please contact Andy. IBID Press will also be publishing new editions of their existing Mathematics texts to the same formula. Their books are expected in April/May. Again, we will be importing stock for the European market. The UK publishers have opted to publish just four books – i.e. Standard Level and Higher Level editions for the two strands. Oxford University Press have been working with the IB and have been allowed early access to the final syllabus. Their SL books are in stock now, with the HL books expected in early March. However, they are only publishing a combined book and online package which makes the book quite expensive. Pearson Education and Hodder Education will also be publishing books in the Summer and early Autumn respectively. Sample pages are available now. Please contact Andy if you are interested. 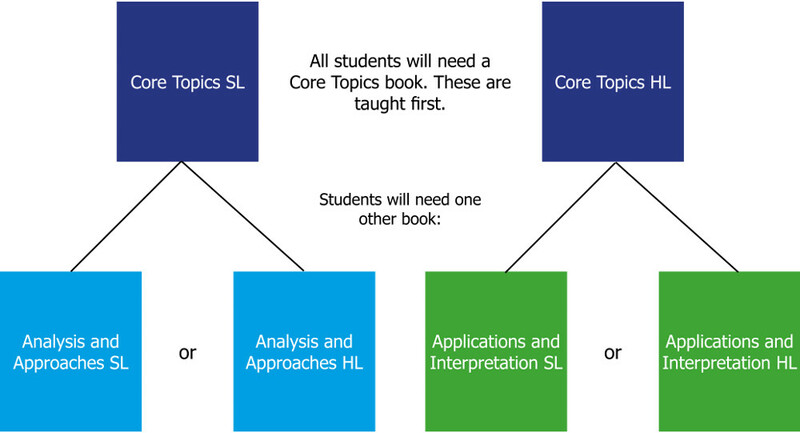 Hodder will also be publishing Teaching Material on their Dynamic Learning platform which we will be able to supply. All titles will be held in stock here at Heath’s IB Bookshop for all schools in the UK, Europe and Middle East for quick delivery. *Please note some prices have not yet been confirmed but should not differ from those shown on this website. New developments are underway to update the IB Diploma Programme (DP) Mathematics curriculum for educators to start teaching in 2019. The aim is that the changes to DP mathematics courses will offer more choice to a greater number of students as well as offering schools greater flexibility in the way they group students, schedule lessons and teach the content. Critical thinking in mathematics is becoming an increasingly valued skill for both employers and universities, especially as some traditional skills become redundant with technology advances. In the context of mathematical learning, critical thinking is the ability to recognise where the subject can be used, understand and synthesise technical documents, apply relevant mathematical approaches to familiar and unfamiliar situations, structure logical arguments, be risk aware, understand that technology and mathematics can go hand-in-hand, and interpret the meaning and relevance of solutions. These are all increasingly important and sought-after skills. How will DP Mathematics address these in the 2019 curriculum changes? DP Mathematics will focus on developing the skills of analysis, abstraction and generalisation, risk awareness and statistical literacy, algorithmic thinking, modelling and inquiry. The diverse needs, interests and motivations of students will also aim to be met. Designed for students who enjoy developing their mathematics to become fluent in the construction of mathematical arguments and develop strong skills in mathematical thinking. They will explore real and abstract applications, sometimes with technology, and will enjoy the thrill of mathematical problem solving. For students who are interested in developing their mathematics for describing our world, modelling and solving practical problems using the power of technology. Students who take the Applications and Interpretation course will be those who enjoy mathematics seen in a practical context. 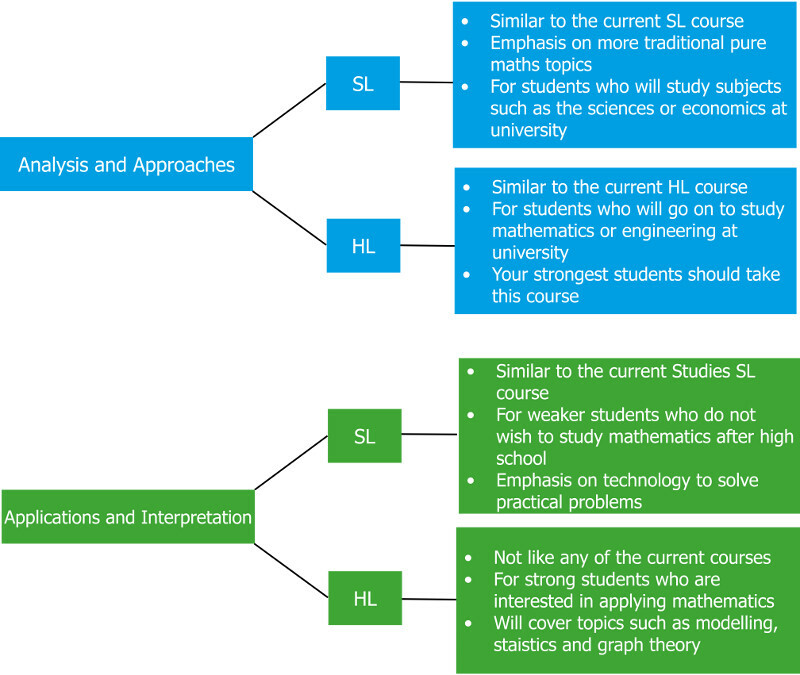 Which course should your students take? What books will they need?